Abstract. Correct use of adverbial modifiers of time and location de signation of ore deposits. Introduction. Portugal. Panasqueira, Beira-Baiza. Urgeirica, Beira-Alta. Iberian Urgerrica pyrite belt - Portuguese sector: general. Salgadinho. Lousal. Aljustrel. Neves-Corvo. Sao Domingos. Spain. Iberian pyrite belt - Spanish sector (Huelva): Rio Tinto. Tharsis. La Zarsa. San Telmo. Sotiel. Aznalcollar (Sevilla). Almaden, Castilla la Nueva. Bilbao, Viscaya. Cartagena, Murica. Linares - La Carolina, Jaen. Reocin, Santander. Villabona, Asturias. France. Abbaretz, Anjou. Massif Central: general. Forez, Auvergne. La Crouzille, Limousin. Largentire, Ardche. Malines, Gard. Saint Salvy, Tarn. Salsigne. Salau, Arige. Sentein (Bentaillou), Arige. Belgium - Germany - Netherlands. Moresnet - Aachen - Limburg. Switzerland. Binnatal, Valais. Italy. Calabona, Sassari (Sardegna). Campiglia Marittima, Toscana (Livorno). Massa Marittima, Toscana (Grosetto). Elba (Isola d'). Gorno, Bergamasc Alps (Lombardia). Monte Amiata, Toscana (Sienna). Monteneve, Alto Adige. Raibl (Cave del Predil), Udine. Salafossa, Belluno. Southwest Sardinia, Pb-Zn-Ag-Ba belt. Iran. Sar Cheshmeh, Kerman. Maps. Spain and Portugal. France, Belgium, Northwest Germany, Netherlands. Italy, Northwestern Yugoslavia, Southwestern Austria, Southwest Switzerland. Indices. Index of authors. 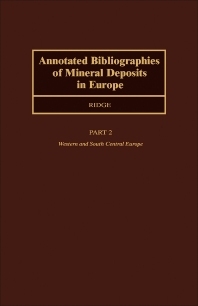 Supplementary references for Annotated Bibliographies on Mineral Deposits of Western and South Central Europe. This volume provides bibliographic and textural information which gives a real understanding of the 40 ore deposits in Western and West Central Europe. Each deposit is introduced by a selected bibliography listing the most important literature. This is followed by a detailed discussion covering geological characteristics including the position, grade and tonnage of the ore produced together with potential reserve, the stratigraphy and structure of the rocks of the district, and the characteristics and age of the ore body. The book also includes a section of maps, pin-pointing the most important mineral deposits in each region, making this work a valuable reference source for all those working in the fields of ore-deposit geology and exploration.